However, just because Fall is typically the best season to be pregnant, doesn’t mean it doesn’t come without its challenges. 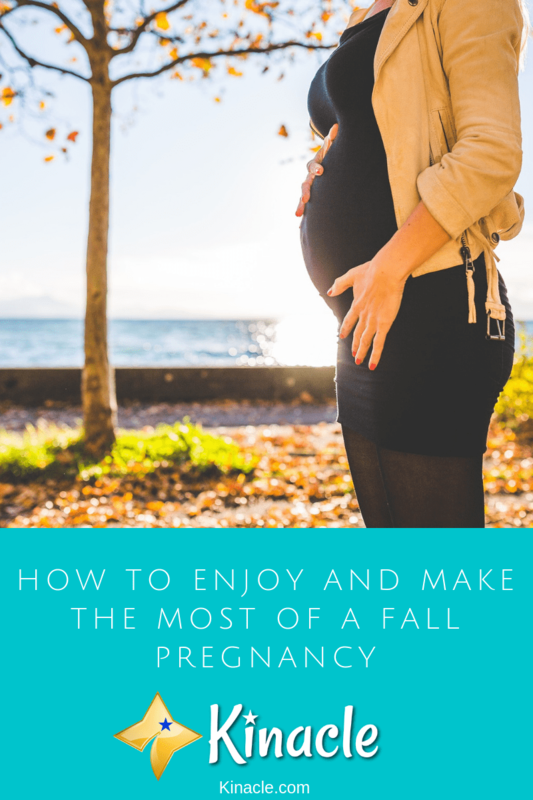 If you’re looking to make the most of your pregnancy this season, below you’ll discover how to enjoy a Fall pregnancy. Finding fashionable maternity wear can be a challenge, but it’s much easier in Fall! Not only is Autumn maternity wear stylish, but it’s also comfortable too. In summer, you have stifling temperatures to contend with, leaving you feeling uncomfortable and often worsening the symptoms of pregnancy such as swollen feet. Any clothing can feel too uncomfortable when it’s too hot outside. In Fall however, it’s all about layers. You can put on layers if you get too cold and take them off if you feel too warm. You can wear stylish flat boots, long loose sweaters and knitted dresses. So, embrace being able to have a fashionable, more comfortable pregnancy in Fall! When the weather is hot and sticky, the last thing you feel like doing is exercising. However, in Fall the temperatures are much cooler so getting outdoors to exercise is easier. Although you don’t want to go over the top with your pregnancy exercise routine, staying fit and active is going to help a lot when baby actually arrives! You could also include your partner, or a friend if you’re single, to make it more of a bonding, fun exercise. Head out on a cozy Fall walk. Take in the beautiful scenery and create memories you can look back on. When you’re pregnant, it’s crucial you get plenty of rest and relaxation. The great news is, Fall is the perfect time to take it easy. As the night’s as getting colder and darker, what better way to relax than in your comfortable pajamas, laying on the sofa with a thick blanket and a cup of cocoa? You’re not going to get much time to relax and enjoy these quiet moments once baby has arrived. So, you may as well make the most of it now. There’s a lot of fun activities you can take part in during the Fall. As Halloween approaches, why not carve out a pumpkin for your baby too? They may not be here yet, but they are still very much part of your family. So, you can carve out a pumpkin, take pictures and show it to your little one when they grow up. Of course, activities like pumpkin carving will also take your mind off the pregnancy and give you a new way to celebrate baby’s impeding arrival. If you haven’t revealed your pregnancy yet, you could even use this as a great reveal idea. Carve out a pumpkin for each member of the family, with a small pumpkin representing your baby. Then take a photo and send it to your friends and family. Although it might not feel like it right now, you’re going to want to look back and remember your pregnancy. The horrible side effects and emotional rollercoaster will soon be well-forgotten, and you’ll be able to look back and remember the good things about the pregnancy. To help with this, taking beautiful maternity photos is a great idea. You’ll have the breath-taking Fall scenery as a backdrop and you’ll end up with memories you can cherish forever. Although Farmer’s markets run all year round, in Fall they’re especially magical. You can head to your local Farmer’s market and pick up delicious, fresh produce. This will also help you to stick to a healthier diet packed full of vitamins and minerals. While you do need additional calories when you’re pregnant, you don’t actually need as many as you might think. It’s crucial you eat a healthy diet throughout and while Fall does have its many benefits, it does tempt you into eating the wrong types of foods. The colder weather makes it much easier and preferable to turn to warm, comfort foods. So, heading to Farmer’s markets and picking up plenty of fresh seasonal produce will help to ensure you stick to a healthy diet. If you haven’t had your baby shower yet, now is the perfect time. It gives you a great excuse for a celebration and a day where you can just let your hair down and relax. It also gives you plenty of creativity to organize a spectacular memorable shower. You could even combine it with Halloween and host a unique spooky themed shower. This would also give you the opportunity to dress up too. When baby comes along, you’re going to have very little opportunities to just let your hair down with your friends. So, organize a baby shower to get together, have a good time and get excited about baby’s arrival. Did you know your immune system can start to become weaker in the Fall? It’s no secret that most of us get ill more frequently during the colder weather. Obviously, when you’re pregnant staying healthy and cold-free is essential. So, you’ll want to start taking extra precautions to protect yourself against germs. This includes washing your hands more frequently, staying away from people who are sick and carrying a hand sanitizer with you whenever you venture out in public. Being pregnant during the Fall can be a magical and enjoyable experience. It’s one of the best times of year to be pregnant, especially during the later stages! You can follow the tips above to ensure you have the best possible Fall pregnancy experience. Do you have your own tips for enjoying a Fall pregnancy? Let us know in the comments below.